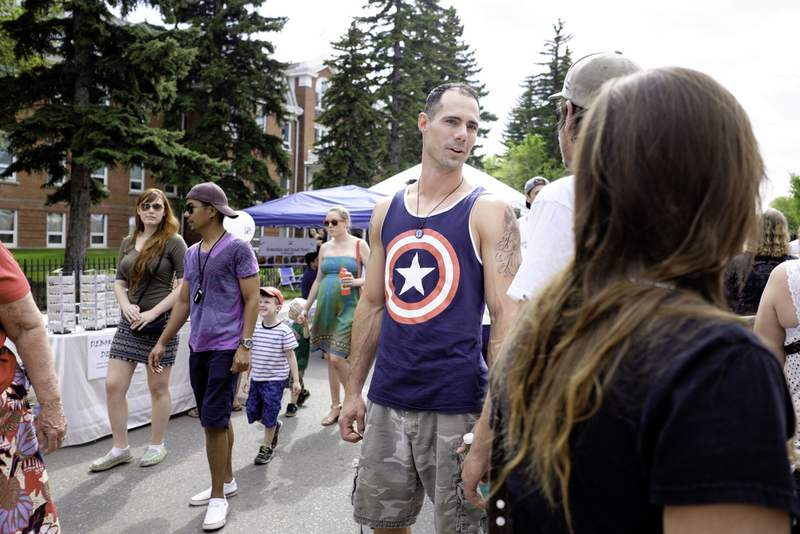 Last Saturday the Cathedral Village Arts Festival street fair popped up along 13th Avenue. The fair is usually scheduled for the one furious downpour in May, but this time the sun held and the crowds kept pouring into the street until the afternoon turned into a sludgy mess of dogs on leashes and toddlers zigzagging back and forth and parents stumbling after with increasingly shiny skin and bearing tubes of high-SPF lotion. So I thought, Hey, let's photograph that hot mess o' humanity. I put a 28mm lens on my camera and threw it into shutter priority, which is something I never, ever do. For some reason, shooting in shutter priority is even more alien to me than working in manual mode, but it's probably the best thing for street photography. At the very least, I won't come home and discover that my favourite shot of the day is actually a blurry mess. Usually I take some degree of care in setting up a shot, choosing my depth of field and so on, but in this case I just wanted to chop some rough moments out of the noisy, sweaty tree of the day. Metaphor accomplished! Good talk. At first I found the colours overwhelming, as if'd been thrown into William Eggleston's reject bin, so I started off thinking in terms of black and white. After a while my brain adjusted and I began to see photographs inside the constant flow of people, and I could start letting colours in. Hands down, my favourite image of the day and the moment when I finally felt as if I'd figured out how to shoot the street fair. And pretty much the last shot I took. Also, there's a guy with a white top hat in the far right of the frame. I looked at this image for several minutes in Lightroom before I realized he was there. I called this guy The Captain, for obvious reasons. He was standing in the middle of the street as if he had nothing better to do than be in a spot and have muscles. For less than obvious reasons, he was wearing a pendant with the Eye of Sauron. I guess Mordor has a Gold's Gym to go with its orcs and fens and cruel mountains. One of the difficulties (or should I say challenges? Yes, why not) of street photography is thinking about how to portray children. Parents get a bit wigged out when some sunburned rando starts swinging a lens at their kid. The solution? Creep up behind them and photograph the top of their head. This, I'm sure, is acceptable practice, unless someone decides that I'm a sick head-top fetishist. This drummer just wouldn't stop. I wonder if he's seen Mad Max. The umbrella woman! I confess to following her around and shooting her from different angles. But this one that shows just a bit of her face stayed with me. About the photos: These were all taken with my Fujifilm X100T with the WCL 28mm converter attached. I wanted to come home with photos that showed clumps of people interacting with each other, milling around, talking, walking, coughing, buying stuff and slowly falling prey to heatstroke. It's a photographic style that's tough to pull off, because when you're inside a crowd, people don't obligingly arrange themselves into neat narrative-revealing compositions. You have to wait, watch, pick subjects and find the right moment. With a 28mm lens stopped down to f8 or thereabouts, the difficulty multiplies because you can't easily isolate subjects (unless you get right up in their faces) or employ a tastefully shallow depth-of-field. Backgrounds are crowded, people are doing distracting things at the edge of the frame and benign chaos pushes your attention around. I'm much more comfortable with a 35 or 50mm frame, but I hear there's value in working outside of your normal parameters. For a number of images I used a camera with a 50mm lens, but I decided not to include any with this post because they're markedly different in their subject matter and attitude. As mentioned earlier, I kept the camera in shutter priority (or "Time Value Priority" if you're one of those Canon-wielding weirdos) for most of the day, shooting at 1/250th of a second with the ISO at 200 and letting the aperture do what it wanted. The camera alternated between f6.4 and 7.1, which meant that I could get enough depth of field to be able to shoot quickly without fretting too much about focusing (I could have done manual focusing, but you know. I didn't.). Black and white images were processed in Lightroom CC with a modified version of VSCO's Fujifilm Neopan 400 film simulation. The colour images were also processed in Lightroom using the Provia film profile (except for "Plaid Cap," which I think uses the Classic Chrome profile).